Gigantic ultrabook. 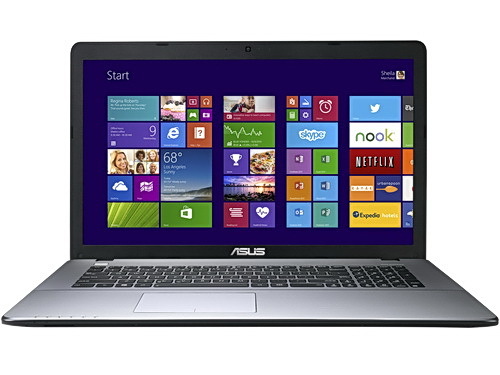 The Asus P750LB relies on power- and space-efficient ultrabook components. How well will this concept work out when combined with an extraordinarily large 17.3-inch display? Can it compete against its competitors that rely on standard, higher-powered Intel chips? 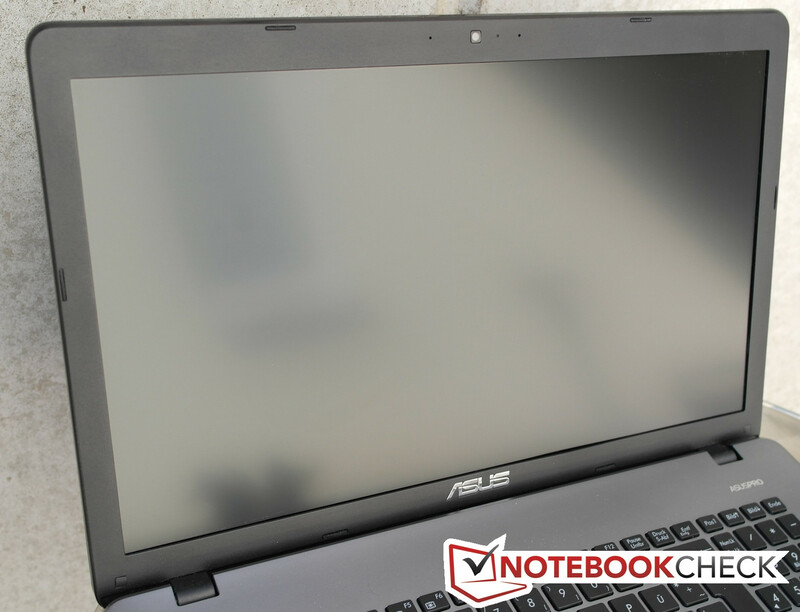 The Asus P750LB is a true all-rounder aimed at office and entry-level business applications while also remaining capable of playing at least some modern games due to its dedicated Nvidia GeForce GT 740M GPU. Its simple, yet somewhat elegant design fits the traditional office market quite well. 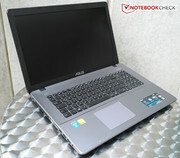 Our test device comes with the base components only, among them an Intel i3-4010U CPU, 4 GB of DDR3 RAM and a 500 GB HDD. 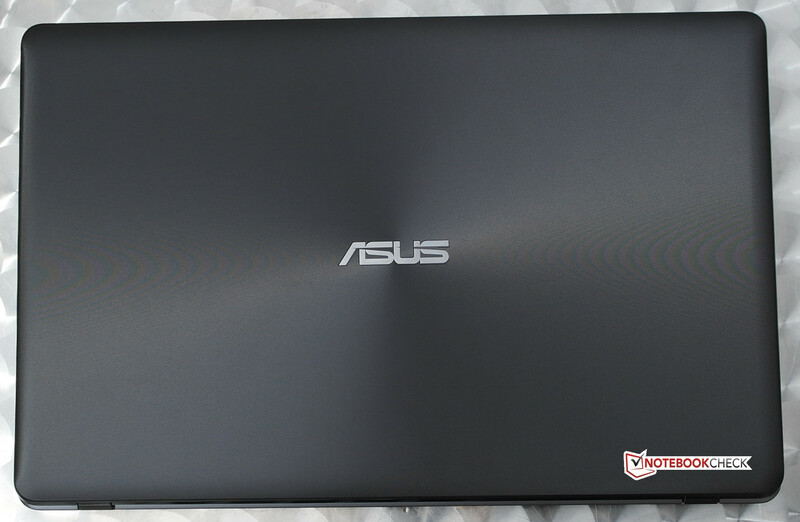 Additional features such as the Ice Cool palm rest or the Sonic Master Sound system are intended to give the Asus laptop an edge in comparison to its competitors. We will use two of these, the Acer Aspire E1-772G and the HP ProBook 470 G0 in order to reveal the P750LB's strengths and weaknesses. While the CPUs and their performance levels differ considerably, all these devices are aimed at the same customer group with their dedicated GPUs and 17.3-inch displays. 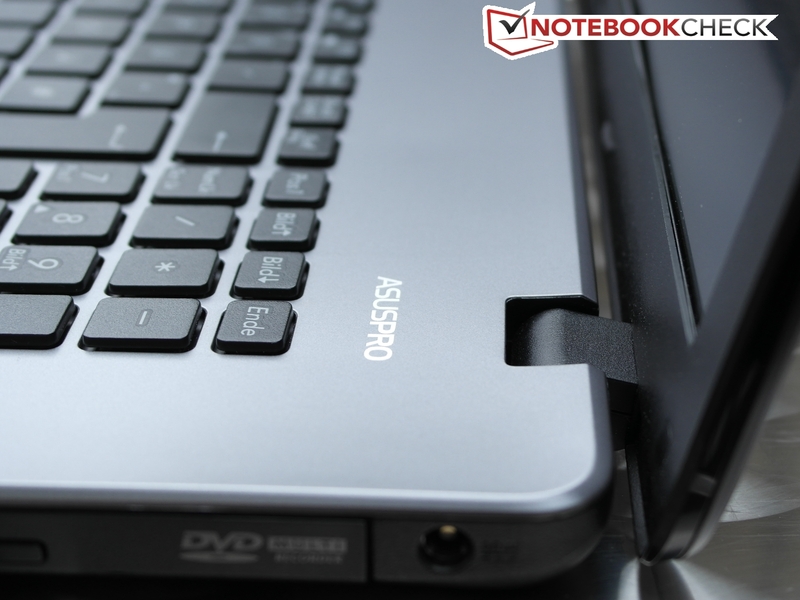 The chassis of the laptop has a high-quality feel to it, being made from plastic in subtle shades of gray and black. The build quality is good, too, thanks to the even clearances. The lid comes with a subtle rippled texture that not only looks nice, but also leads to a firm grip. The same rippled surface is used on the palm rest as well. Not quite as good: The hinges. Although they do manage to keep the display in its intended position, pushing against the lid easily overcomes their resistance, leading to a noticeable change in the display angle. All in all, the design language is simple while remaining "respectable". Only the stickers on top offer some color. Due to the enormous screen, the laptop is one of the larger ones we have tested - while still retaining compact enough dimensions to fit into a large ordinary backpack (a feat most other 17.3-inch laptops do not manage as easily). Similarly, while 2.6 kg (~5.7 pounds) is not to be laughed at, this remains a low weight for a 17.3-inch device. There is no maintenance hatch. Even when all screws on the bottom of the device are loosened, no components can be accessed by the customer, making it difficult if not impossible to replace the RAM modules or the battery all by oneself. The same holds true for any cleaning procedure of the fans. Most ports are located regrettably close to each other, possibly causing some issues. For example, the VGA and HDMI ports cannot be used at the same time (depending on the cable) The USB 2.0 and 3.0 ports on the left and the right of the device are also too close to each other (two on each side) to allow for extraordinarily large devices such as flash drives to be connected simultaneously. Even worse is that all the ports are located close to the front of the device, making it unnecessarily difficult to use a mouse, when items are plugged into these ports. All three major communication standards (Ethernet, Wi-Fi, Bluetooth) are supported by respective modules. A UMTS module cannot be inserted, not even afterwards. The Wi-Fi module works well, with a stable connection being maintained even when 15 meters (~49 feet) and a massive wall are being placed between the router and the device. 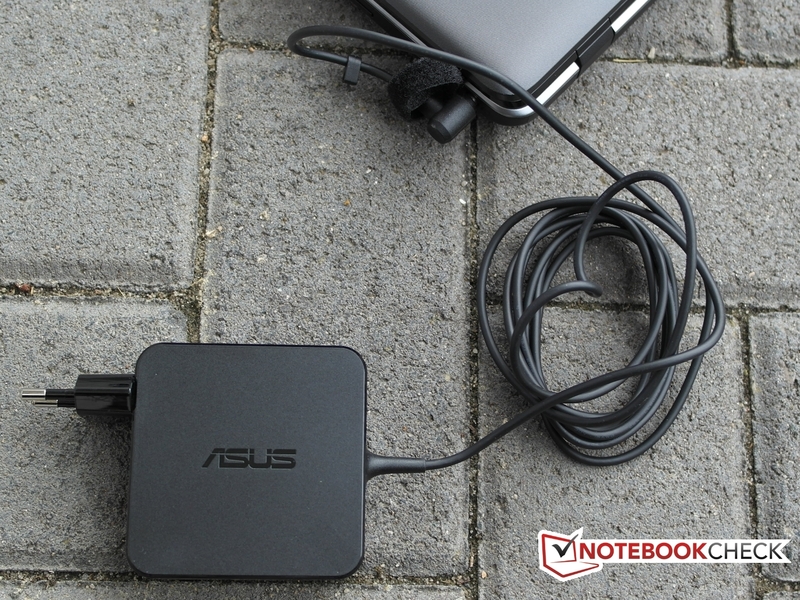 Like most modern laptops, the Asus device comes with a Kensington Lock to prevent thefts. Additional security features (such as a smart card reader or a fingerprint scanner) have not been employed, not even on the software side. If the user feels the need to augment the functionality of the device, he or she has to become active him- or herself. Next to the power adapter, no noteworthy accessories are included (or even purchasable). Apparently, Asus denies access to the laptop's innards on purpose, making it much harder (if not impossible) for the user to upgrade or replace components. 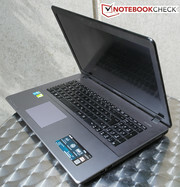 In this regard, it behaves like a true Intel ULV-based ultrabook. Asus offers 2 years of warranty on hardware defects, but no extension packets can be had. 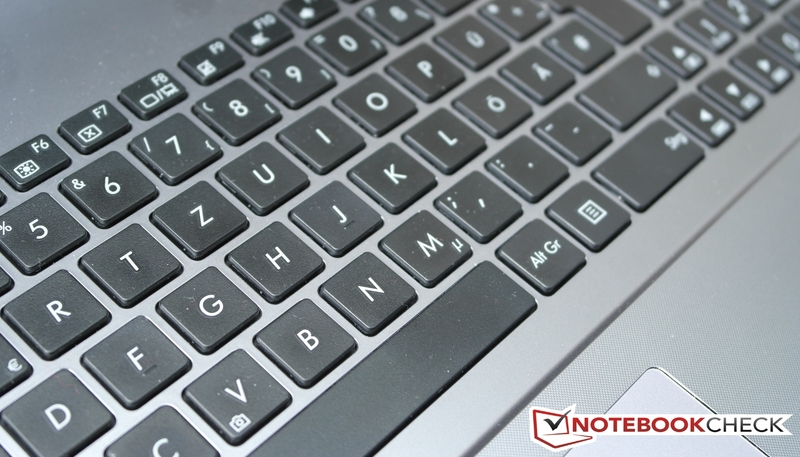 The Chiclet-style keyboard of the Asus delivers a mostly convincing performance. It has terrific build quality - nothing rattles, no part of the area surrounding the keyboard can be pushed back into the chassis - and its sufficiently large keys with equally sufficiently large free patches in between are great assets. Unfortunately, the keyboard is not backlit, but at least the black keys with their white font are easy to discern in front of the grayish rest of the base unit. Key travel is a bit disappointing (too shallow), but this cannot easily be prevented in such a comparatively thin device. Still, the pressure point is firm, making it hard to miss a keystroke. The same holds true for the number pad keys, although these end up being a bit slimmer. To reiterate once more: The palm rest remains cool at all times. Together with its ripples, this leads to a very comfortable feel while typing. The touchpad is on par with the keyboard quality-wise. Thanks to its large size and its smooth, sliding-friendly surface, it is easy to use. 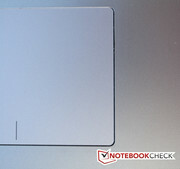 Although it is a one-piece ClickPad, the left and right click areas have been separated by a small marker. These clicks require a bit more pressure, but the mouse pointer itself could be controlled with great precision and reliability. Common multi-touch gestures such as scrolling or zooming work well, too. The most affordable version of the P750LB comes with a 17.3-inch display resolution of 1600x900 pixels (16:9 aspect ratio). The utilized TN panel is matte, making it easier to work outdoors. A similar (same type, same size, same aspect ratio) yet better screen with a Full HD panel (1920x1080 pixels) can be chosen as well. Asus' competitors sport a Full HD display (Aspire E1-772G) and an HD+ screen (ProBook). 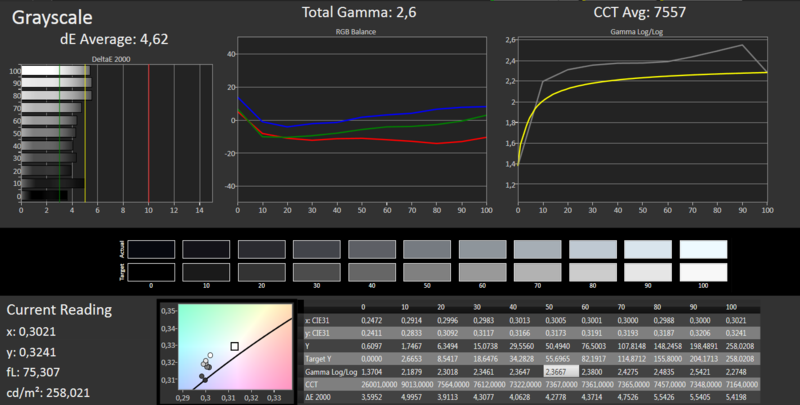 Brightness homogeneity levels are still acceptable, with a deviation of around 10% from the average. Overall brightness is decent as well, reaching a mean of 236.1 cd/m². The HP ProBook 470 offers just a little more, but the Acer Aspire E1 is noticeably brighter, yielding 321.7 cd/m². Luckily, the Asus P750LB does not seem to suffer from clouding (uneven brightness distribution) or light bleeding at the edges, which is especially prominent when watching darker scenes in movies. 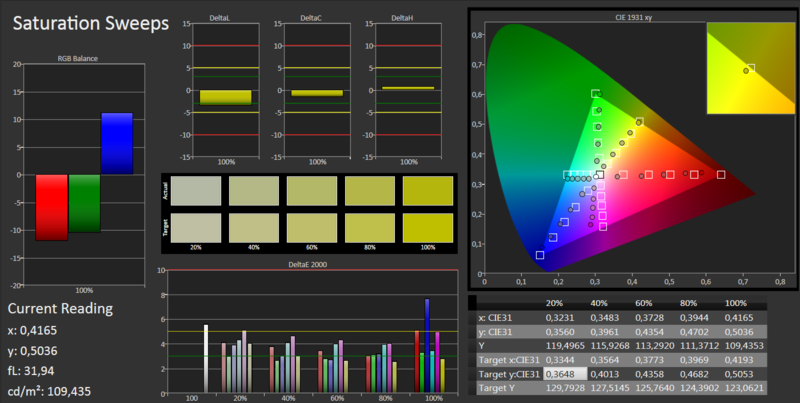 Its black levels of just 0.66 cd/m² are as mediocre as is its contrast ratio of 361:1. This is an average value at best, both when compared to all other laptops and even to its two direct competitors, with the ProBook 470 yielding an even worse contrast ratio of just 272:1 while the Aspire E1 at least manages to achieve a better ratio of 757:1. 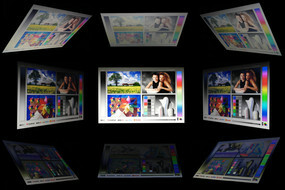 The display is sufficient for daily usage if no special requirements in terms of color rendition are to be met. 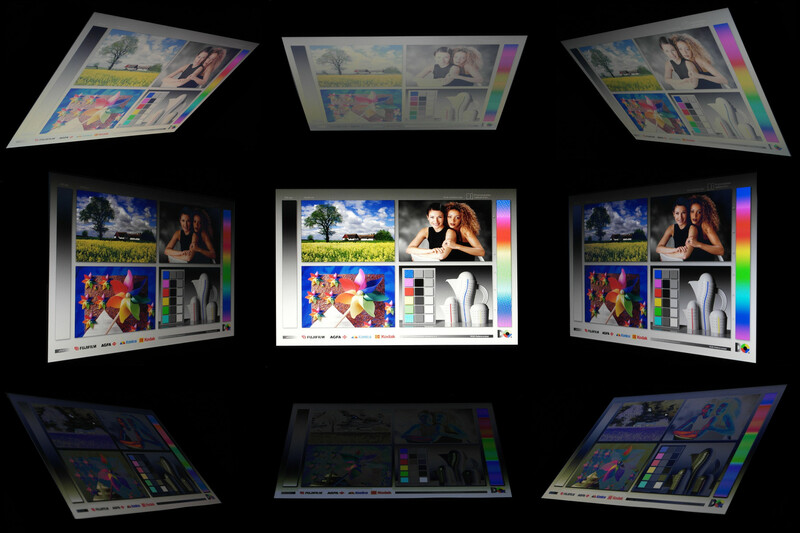 This can also be seen by looking at the color space rendition, which is important to those working with image editing software. 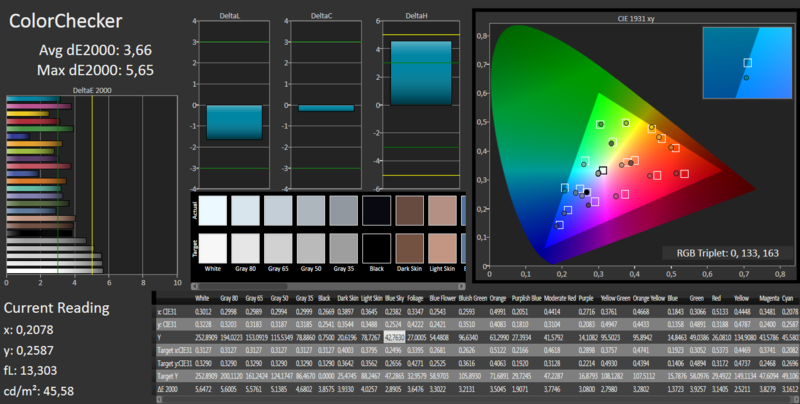 Both the sRGB color space (72%) and the Adobe RGB color space (52%) can only be rendered in small parts. At least, Delta E deviation levels are better than those of its competitors, reaching 3.66 (color) and 4.62 (grayscale), a more-than-decent value for a more affordable laptop. The AsusPro can actually be used outdoors. Although its peak brightness levels are barely sufficient, the matte surface helps a lot, making it possible to clearly see all screen contents, as long as the sky stays cloudy or as long as there is no direct sunlight on the screen itself. Otherwise, looking for a location in the shade might be an advisable course of action as doing actual work becomes more and more impossible. 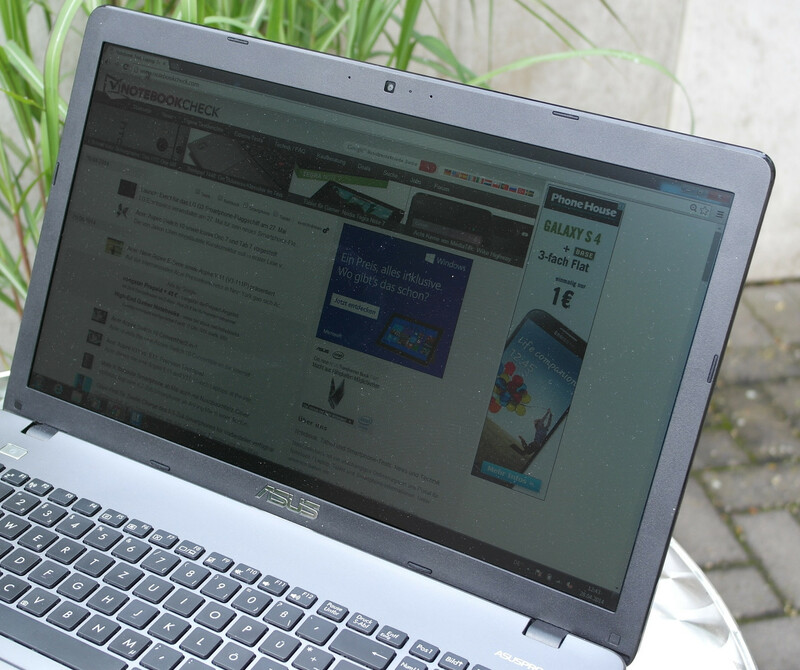 The Asus P750LB outdoors (cloudy weather). As can be seen in the shot below, the horizontal viewing angle stability is quite good for a TN panel, making it possible to share a movie with a few friends, for example. The same does not hold true for vertical alterations, which result in significant color changes. 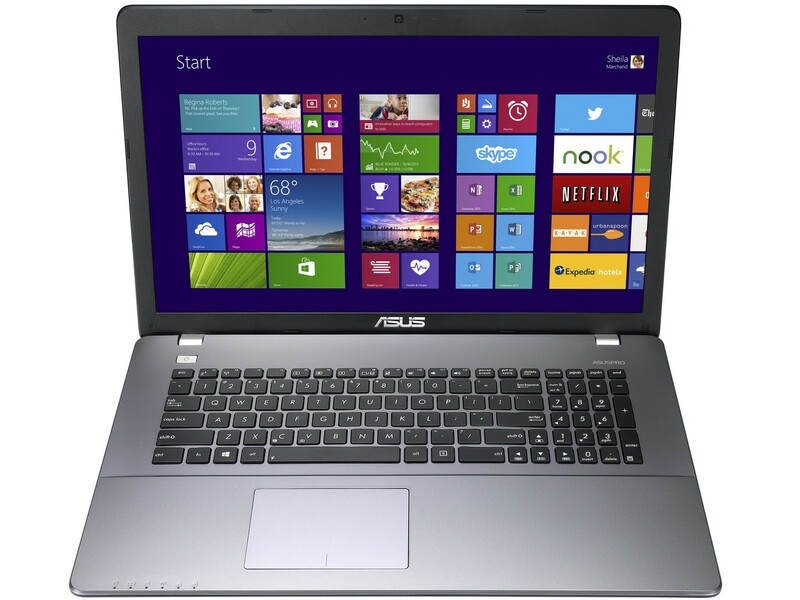 The Asus P750LB is being sold as a 17.3-inch multimedia and office laptop. Accordingly, its components such as the Intel i3-4010U CPU and 4 GB of DDR3 RAM (clocked at 1600 MHz) are fast enough for most expected usage scenarios, but still lag behind in terms of performance when compared to their competitors. Then again, Asus offers a range of different models, including ones with an Intel i5 or i7 CPU as well as a Full HD screen (instead of HD+). Up to 8 GB of RAM and 1 TB of mass storage space (two 500 GB HDDs) can be had. The price range for all of these configurations lies between 630 and 900 Euros (~$862 and $1231). In contrast to all these differences, even the base version comes with a dedicated GPU, namely the Nvidia GeForce GT 740M. Our test device ships with a current-generation (Haswell-based) Intel i3-4010U CPU. Often used in ultrabooks, the "U" stands for ULV, an Intel moniker describing processors with especially low power consumption rates, thus less excess heat, and an improved battery runtime. In order to reach these goals, the CPU clocks at just 1700 MHz, with a TDP of 15 Watts. Since the i3 marks Intel's higher entry-level class, this CPU is capable of Hyperthreading and working on up to four threads at a time, but it comes without any Turbo Boost capabilities. Luckily, no throttling occurs even after hours of stress tests. Additionally, even running on battery does not decrease the performance of our test device, allowing the CPU to keep running at 1700 MHz. The performance levels of the P750LB are no surprise. The i3-4010U is definitely fast enough for most common daily tasks so that not every potential customer might have to switch to a better-performing higher-end model. Its two competitors are noticeably faster thanks to their better CPUs. Still, the comparison chart has to be taken with a grain of salt since our test device can also be had with a much more powerful CPU. The system performance benchmark results yielded by PCMark 7 are not easily comparable to each other since the CPUs used in the different laptops differ greatly depending on the price and the performance of the processors being employed. With a faster CPU, the P750LB would be likely to come to lie on par with its competitors, but the actual results are perfectly fine given the i3 being used. It should not come as a surprise that the mediocre benchmark results translate into a rather mediocre speediness during daily usage. Although all usual programs run just as expected, some tasks may take one or two seconds longer than expected. Naturally, these issues could be prevented with a higher-performing model based on an i5 or i7 (or by installing a SSD instead of the HDD). Still, those who do not want to spend too much money while being content with just-average performance will be happy with the i3, too. 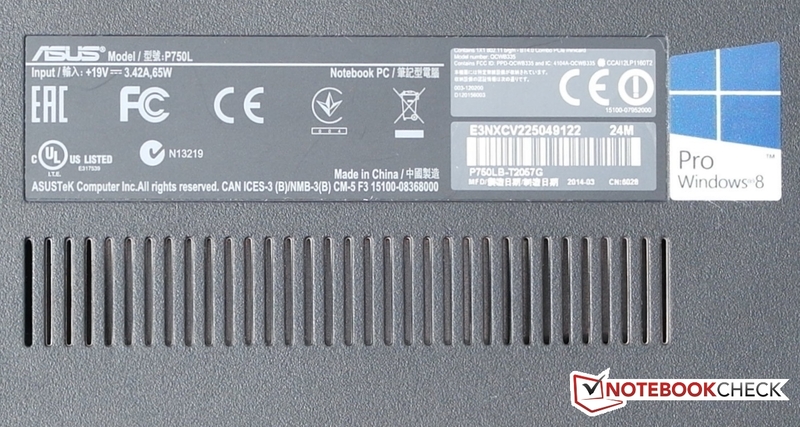 The Asus P750LB relies on a conventional hard drive with a capacity of 500 GB, being made by Toshiba (model MQ01ABF050) and spinning at 5400 rpm. Testing its performance via HD Tune yields stronger-than-expected dips of the data transfer rates during some stretches, but on average, the transfer speeds are quite decent for a conventional hard drive. Noticeably, the burst rate is very high while the access times are just acceptable. CrystalDiskMark corroborates all results, with no major weaknesses becoming obvious. Overall, this HDD seems to have been the right choice for such a laptop, one that does not aim at top performance levels. Next to the integrated Intel HD Graphics 4400, our test device also comes with a dedicated graphics card, the Nvidia GeForce GT 740M with 2 GB of dedicated DDR3 RAM. Right now, this is actually a next-to-last-generation chip still being based on the older Kepler architecture. As long as no graphics prowess is required, the Intel chip suffices. Otherwise, the Optimus technology allows the laptop to switch automatically to the dedicated GPU, leading to greater performance levels, e.g. in games, and much improved energy efficiency during office tasks. Both graphics chips support DirectX 11, offering mid-level performance sufficient for somewhat older games with medium settings. Likely due to the weak CPU, the benchmark results (3DMark 11) are not quite as good as those of different devices with the same graphics card. 1790 points mean a place right in the middle of the field. The performance of the GPU actually decreases a bit while running on battery, but gaming remains viable. The same holds true when talking about the actual gaming performance: Again, the Asus laptop takes a spot in the middle of the field (tested with Anno 2070). Most slightly older games can be played with everything set to high or medium (depending on their exact age). Only newest-generation games such as Thief are too much for the Asus P750LB. Thus, while the GPU is sufficient for casual gamers, everybody else might want to invest in a much more powerful solution. For smooth gaming at high settings, an Nvidia GTX 850M or an AMD R9 M270 might be the minimum. 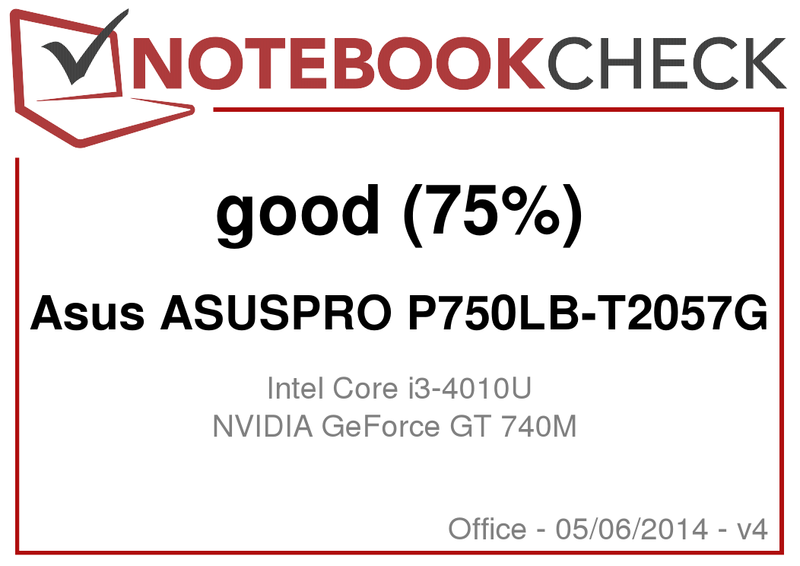 Again, as with the benchmarks, when compared to other laptops with the same GPU, the Asus P750LB fares worse by approximately 10% (with the Dell Latitude 3440 representing these machines). The P750LB comes with a very efficient cooling system. Even under load, no more than 34 degrees Celsius (93.2 degrees Fahrenheit) are measured. This is in no little part thanks to the power-efficient (and thus cool) CPU. The promise made by Asus for its "Ice Cool" palm rest is being kept, and we do not only say that due to our own experience: Even the measurements never show more than 31 degrees (87.8 Fahrenheit) under load. Even more notable is our stress test result achieved by running Prime95 (CPU benchmark) and FurMark (GPU benchmark) simultaneously for more than one hour. Both chips remain astonishingly cool at 55 degrees (CPU; 131 Fahrenheit) and 54 degrees (CPU; 129.2 Fahrenheit), far away from critical temperatures - meaning that the laptop would be capable of cooling much more powerful components. 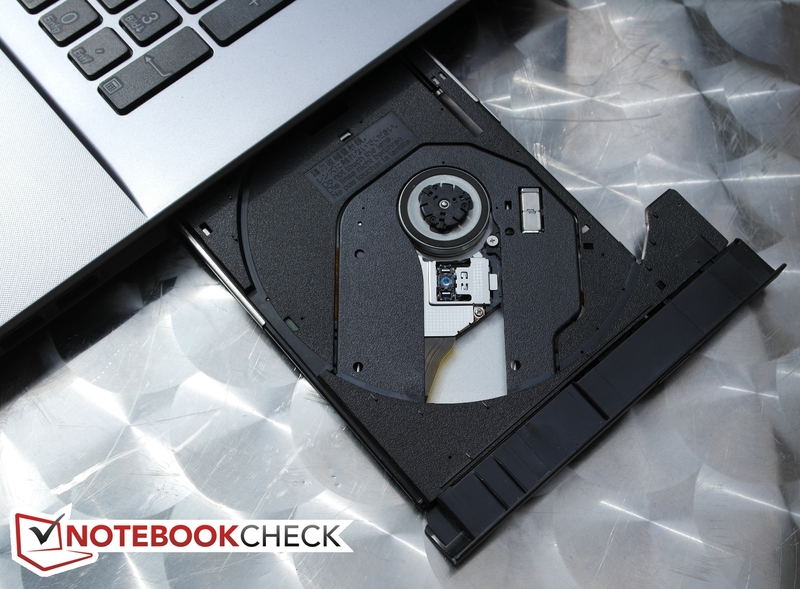 This has a number of implications, ranging from no observed throttling (downclocking due to overheating) to enormous stability and even user confidence, knowing that he or she cannot possibly overheat the laptop. Thanks to the large cooling system, the fan never has to spin exceedingly fast (and thus exceedingly loud). Most of the time, it can barely be heard. Under load, the fan will be noticed, but its noise remains tolerable. This also holds true when comparing the Asus laptop to its competitors, none of which is as silent as the P750LB. One disadvantage: The HDD clatters audibly. The integrated speakers do their job, no more, no less. While there is not much noise to be heard, neither bass nor highs are clear. As with most laptops in this category, the maximum volume is also just sufficient if no ambient noise has to be drowned out. Our test device ships with only a combined Line In/Out port (3.5 mm).Our test device ships with only a combined Line In/Out port (3.5 mm). 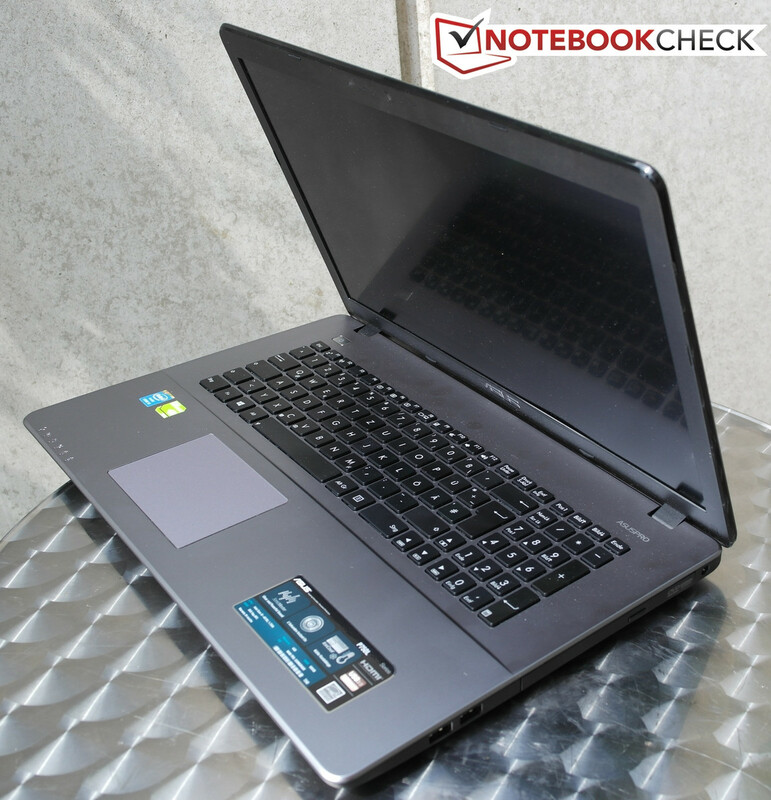 When compared to the Aspire E1 and the ProBook 470 the P750LB offers less power consumption. Then again, this is no wonder, as the Asus is the only laptop to ship with an Intel ULV processor (despite all three of them sporting dedicated GPUs), leading to lower performance levels as well. The power adapter is (more than) sufficiently large, offering approximately 65 Watts. The battery capacity of our test device is approximately as large as that of its competitors - at 45 Wh - but the battery cannot be swapped by the user due to the glaring absence of a maintenance hatch. The P750LB ships with its own energy management software in addition to Microsoft's energy-saving plans. We have used the Battery Eater tool in order to measure the battery runtime of our test device. The Reader's Test (minimum brightness, all wireless off, energy-saving mode on) yields a maximum runtime of 5:39 hours, on par with the ProBook 470 and slightly ahead of the Aspire E-1 (approx. 5 h). The Classic Test (maximum brightness, all wireless on) results in a battery life of 1:39 hours, almost twice as much as that of the other (non-ULV-based) laptops of its class. A realistic value while browsing can be gained with a number of standardized settings (energy-saving mode on, brightness set to 150 cd/m², Wi-Fi on, opening a new webpage every 40 seconds). During this test, the Asus laptop once again takes the crown, approximately 30 minutes ahead of the Acer and even one hour ahead of the HP. More demanding tasks such as Full HD movie playback lead to a noticeable reduction in runtimes, bringing the battery life closer to the full load scenario. At least, 2:19 hours should be enough for most movies. Interesting: Only under medium or high loads does the battery life of the P750LB beat its non-ULV competitors by a wide margin. Where there is light, there is also shadow. The base price point of 600 Euros (~$821) might be a bit too high for the performance the Asus P750LB offers. On the other hand, both the build quality and the cooling system are great, as are the more-than-decent input devices (and the always-cool palm rest!). Unfortunately, the display is mediocre at best. We do hope that the more expensive Full HD variant will improve upon this. However, even without such an improvement, the Asus laptop is an interesting compromise between a lightweight, rather compact laptop and an enormously large mobile display. That is why we guess that this device might sell well, and that Asus' customers might not be disappointed with it as long as they do not require top-notch performance. Those who are fond of the underlying concept while being aware about its shortcomings might have found his or her laptop - no matter whether it is destined to become a business or consumer device. If a better display is a must, the Acer E1-772G might be a viable alternative while the HP ProBook 470 proves to be a great device for those in search of more raw processing power. The Asus ASUSPRO P750LB-T2057G, provided by Asus Germany. Asus equips the P750 with just an HD+ display. ...and an HD webcam are on board. The hinges barely managed to keep the heavy display upright. There's a high-quality ripple pattern on the lid. The same design language has been used around the palm rest. The integrated speakers leave a lot to be desired. The power adapter is quite compact. 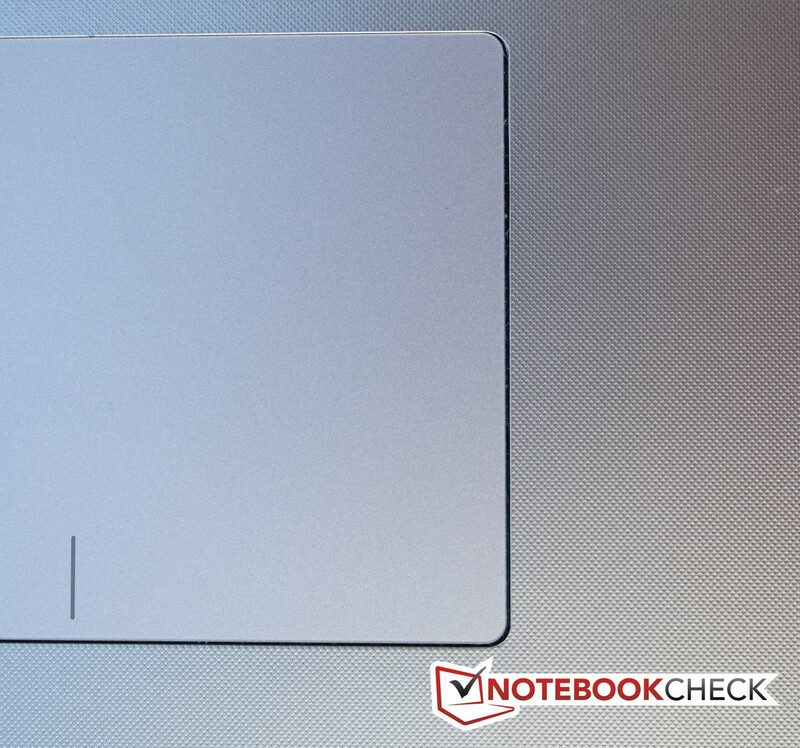 Asus shows off its logo right beneath the matte display. Its build quality, its input devices and the excellent cooling system. The total lack of maintenance options. Even tiny changes such as swapping the battery necessitate professional help. Thanks to its compact dimensions, the P750LB is surprisingly mobile given its 17-inch display.